It’s sort of funny how you come across news. I happend on this photo while browsing my friends photos on Flickr and when I looked at it I learned that this old restaurant The Wheel Inn Drive Inn is closing soon. I know the Wheel Inn because when I was in the Air Force I was stationed near Sedalia Missouri where it sits prominately on the corner of a big intersection there. I had no idea that the place had been open so long–60 years. Their gimmic was the “Goober Burger” a hamburger served with peanut butter on it. I never had one when I lived near there, but I’ve made them for myself since and it’s really quite good. Anyway this old building is kind of typical of it’s era–a late 40’s early 50’s roadside fast food drive inn. It’s a relic of early American car culture. There are some more photos on flickr here. i hope that someone will use the building and keep it intact. it’s a cool old drive-in. goober burgers are, in fact, really good–home made. i make mine with a little mayo, some cheese, and, of course, peanutbutter on a toasted bun. unfortunately, i have eaten there–the Wheel Inn goober burgers (or thier food in general) won’t really be missed as much as the landmark itself–too bad either way . . .
Good thing it’s not spelled “Goober”!! Haha… I’d be afraid there was something other than peanut butter on it. I remember eating there once or twice back in college. 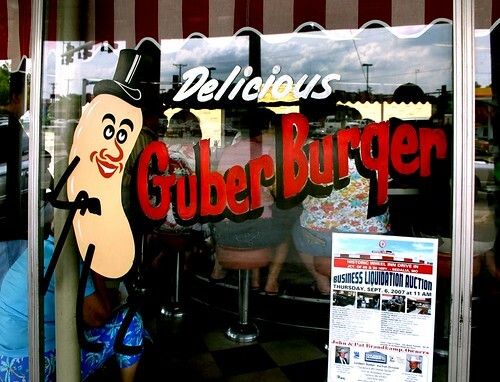 Don’t remember the Guber Burger, though. Hopefully it won’t be torn down for a new Walgreens.